Training and audit tools to establish an internal E/M audit program in a medical office. 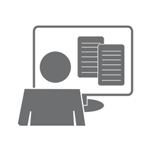 Learn how to analyze medical records to determine whether the documentation supports CPT and medical necessity, and minimize risks associated with outpatient E/M claims. Evaluation and Management (E/M) claims are an ongoing audit risk requiring human oversight. Top carrier audit triggers include repeated E/M billing problems with a carrier, failure to follow non-par Medicare rules, higher than normal distribution of E/M levels of care or a single code, failure to routinely collect deductibles and copays, and random selection by private and government carriers. The OIG says a coding compliance plan should include regular auditing and monitoring of claims. Don’t wait for an audit letter! 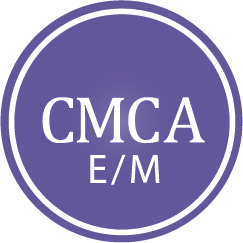 The Certified Medical Chart Auditor-E/M (CMCA-E/M) provides the training needed to minimize risk areas associated with E/M coding and documentation – an important piece of the practice revenue cycle. This certification program is ideal for experienced medical office coders with an interest, experience, and career aspirations in coding and compliance in an outpatient healthcare setting. Learn how to analyze medical records to determine whether the documentation supports CPT and medical necessity based on established coding and insurance carrier guidelines. Complete guided chart audit exercises derived from real case studies. The course includes guided instruction, physical workbook and chart audit tools. Baseline skills include familiarity with E/M coding, regulatory guidelines, carrier medical claim policies, and compliance in a medical office. Knowledge of medical terminology and anatomy and physiology is beneficial. Important personal attributes include strong attention to detail, communication, and organizational skills. No supplementary resources are required for this course or exam. The CMCA-E/M is tailor-made for physician offices. The curriculum places emphasis on evaluation and management coding rules, medical necessity and proper E/M code selection. Participants will learn how to identify documentation deficiencies, as well as consequences and penalties for improper payments for E/M services. Course materials include a manual with coding guidelines, reference documents from the OIG and CMS, step-by-step auditing tools, and case studies. · Day 2 – morning review guided case study exercises and review for the exam; after lunch take the four-hour timed exam. Review course lecture and complete workbook exercises at your own pace. Participants receive a physical course manual with audit tools and case study exercises. Online access is available for up to one year. Participants enrolled in the live webinar course receive the same materials as the Online Training Course above, including access to recordings from the live series after the original recording date. Attend live, instructor-led training in live, 90-minute intervals, broadcast online over 8 consecutive weeks. Watch PMI’s website for live CMCA-E/M opportunities. The exam is a four-hour, timed, open book exam proctored in the participant’s local community. Candidates will complete 130 multiple-choice questions; 104 will apply directly to auditing eight E/M patient encounters from various specialties. The remaining questions cover documentation standards, key components of the encounter, and compliance. Q. How many questions are on the exam and how much time is allocated? A passing score of 70% is required to earn the credential. Q. Is a review session offered? Yes, each live class includes an in-class review on the second day with guided case study audit exercises. Live webinar and Online Training course both include a bonus review session in the student’s online portal. Q. Will this credential help me advance my coding career? Yes, it can! More coding positions are seeking coders with auditing skills. Our customer service team is available M-F, 8-5 Central.